The OVA adaptation Moe Can Change! is created by Frontier Works, based on a free-to-play game developed by Ambition for mobile phones. The original "playful bishoujo Miroid-raising / clothes-changing moe game" has the player joining a beta test program for androids, who the player must raise and dress up as girls. 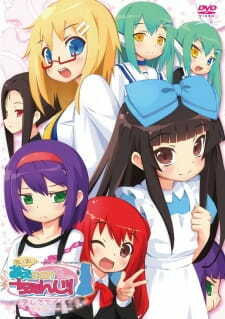 As the synopsis says, this is an OVA adaptation of a popular mobile app in which you create your own moe characters. How did they manage to adapt an anime story to reflect this? I'll tell you. A company on the cutting-edge of technology is preparing to release their latest service: a mobile app that can literally, physically recommend and change your outfit. Sound fun? Each purchase of the app will provide the user with their own personal mairoid (a moe-android). I suppose the consumers would then use the app to change the clothing of their mairoids? The OVA follows two girls, hired as idols by the same company for their moe-affinity. One is your typical 'genki-girl' the other is your typical tsundere. As they go about their day, they inadvertently undergo a series of tests involving the new clothes-changing app. TLDR: It's a show about moe. Watch it if you like moe. The premise of the story is okay enough. An app that changes people's outfits. I think that the story could have been pretty funny and interesting, especially is this was a full fledged TV anime and not just an OVA. The art was pretty good. That was what initially interested me in the show; that and the fact that it would be a short, easy watch. The sound: also fine. I don't really have much to say about that. I thought that the characters were the lowest part in this OVA. There was no character I liked and no character I disliked. I think, for me at least, that the characters are what really makes something good. If I don't enjoy the characters, I probably won't enjoy the show. Overall, I gave this OVA a 6. So, I guess I wouldn't exactly say I enjoyed 'Ai Mai! Moe Can Change!' all that well. But I can't really say I didn't enjoy it, either. If that makes any sense. It's not something I'm particularly glad I watched, but it would be a good thing to watch if you just want something to pass the time or something quick and easy to add to your list.